Product #16523 | SKU VT-747SP | 0.0 (no ratings yet) Thanks for your rating! The Avalon Design Vt-747sp Stereo Tube Compressor / 6-Band AEQ is one of those rare signal processors that sounds incredible on every source. It features minimalist routing; utilising sealed silver relays for all signal and bypass functions. The Twin Signal Path (TSP) makes this unit entirely switchable between tube and solid-state operation. The Vt-747sp's input gain stage provides versatile tone options right off the bat, especially with the tubes engaged. Unity and lower gain settings will keep the unit sounding clean and warm, allowing the compressor to have a light, transparent touch at lower ratios. If more gain and colour is desired, the +10dB switch will instantly add some edge to the sound. With an additional 8dB of gain available above that, the Vt-747sp can push even a quiet signal into the red. In higher gain instances, the compression ratio can be set to feel like a leveller, or it can be increased to a very reactive transient grabber. With ratios ranging from 1:1 to 20:1, the optical compressor can accomplish anything from subtle gain reduction to hard-knee limiting. Two variable-frequency side-chain filters allow you to tune the compressor's frequency response. A side-chain listen function helps pick out the specific frequencies you want to focus it on. A make-up gain control adds up to 10dB to the signal after compression. The 6-Band stereo programme AEQ demonstrates the smooth sound of passive design, and can be placed before or after the compressor in the signal chain. Discrete, Class A high-voltage transistors ensure optimum sonic performance. The fixed frequency turnover, Q and amplitude ranges provide harmonic balance and low phase change. The final output of the Vt-747sp features a master volume control, which allows you to drive the previous stages to their limit without clipping the inputs of your DAW. It can also provide up to 6dB of boost for quieter signals. 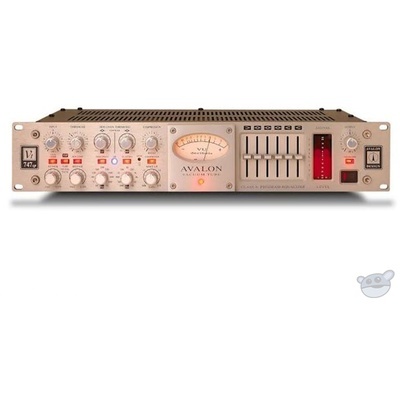 The Avalon Design Vt-747sp Stereo Tube Compressor / 6-Band AEQ offers comprehensive tone shaping control over any stereo source. The Vt-747sp can be used as a tube or solid-state compressor / AEQ. Compression ratios ranging from 1:1 to 20:1 can be applied with emphasis or de-emphasis on 2 parametric bands of side-chaining AEQ. A musical fixed six-band AEQ provides tone sculpting, pre or post compressor. Every parameter of the opto-compressor is user-controllable.